I started actually working at Time Monday. And blogging. So far on Milton Friedman (my favorite subject, apparently), newspaper economics, and hedge funds. At Fortune I posted once a week or so because the magazine only comes out once every two and I didn’t have articles in every issue. Now I’m supposed to write a magazine column once a week, so I’m trying to figure out an appropriate frequency. I think it’s more. The book is … about to be turned in. I meant to today, but I’m still doing some cleanup. 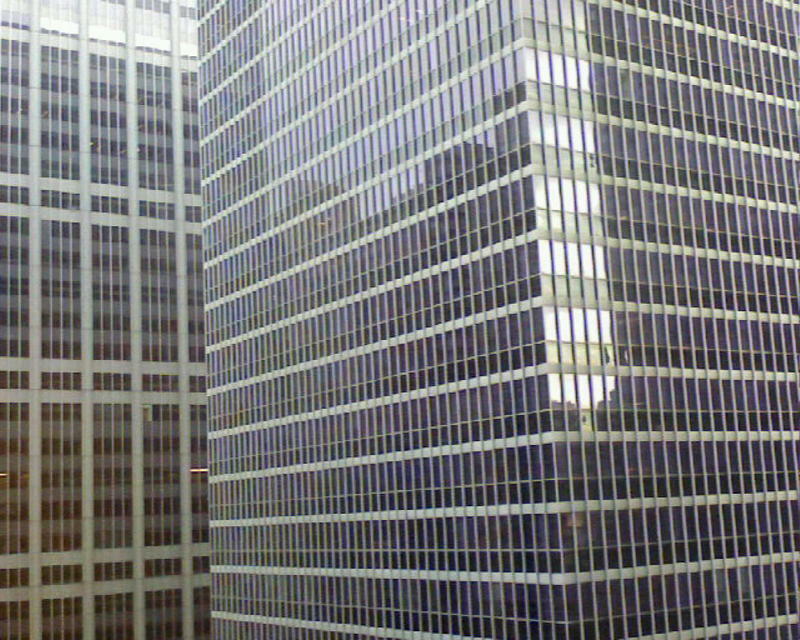 Here’s the nicely geometric view from my new office, on the 24th floor of the Time & Life Building (up from the 15th). Which wasn’t wrong. He spelled my name right, and put it in bold letters. But he failed to mention that I’m also going to be a columnist for friggin’ Time magazine. Which isn’t nearly the big deal it would have been 30-odd years ago, when I first subscribed. Still, it’s something, isn’t it? Blogging’s great and all, and in 10 years there will only be bloggers and Matthew Yglesias will be the richest man in America. But not yet. So anyway, I checked the Post online at 6:30 yesterday morning, and was appalled. This was going to be the main announcement of my new job, it will surely be the only newspaper article written about it, and yet it left out the actual new job. So I did the modern thing, put up a post on The Curious Capitalist setting the record straight, and then sent Jim Romenesko an e-mail about it. After which, nothing happened. Hardly anybody I know saw Kelly’s column. Romenesko missed it, and didn’t see my e-mail about it until too late in the day to do anything about it. And really, who cares? Well, I do. I now have a nice little office at Time, right between Joe Klein and Nathan Thornburgh. I don’t start work there until January 22, before which I really, truly have to get my book manuscript in shape. Then I will start writing columns. Every week, it looks like. Got any topics for me?